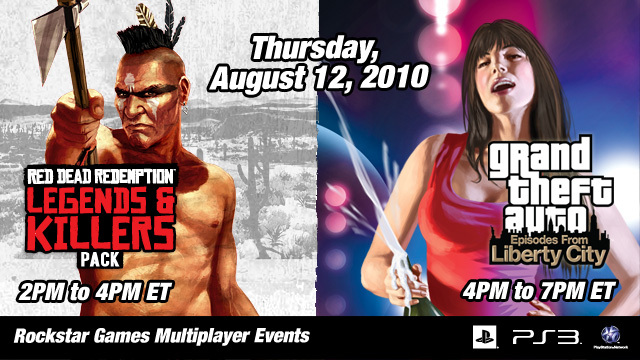 "In addition to our originally scheduled Grand Theft Auto: Episodes from Liberty City PS3 Multiplayer Event from 4-7 PM Eastern, and in celebration of this week's release of the Legends and Killers Pack for Red Dead Redemption, we're adding an extra full two hours of Red Dead Competitive Multiplayer action using the Legends and Killers maps and features online from 2-4PM Eastern. Both events will be on PlayStation 3 since Episodes PC and Red Dead Xbox 360 players got previous dibs - and we'll of course be jumping on to XBL for our next event (also you can always catch us online regularly by following our Gamertag announcements on Twitter and Facebook). As always, the live stream and hosted chat will be available at the Social Club Multiplayer Events page for spectators if you can't get online to play, or for if you want to multitask while playing to get the full experience of the Social Club Multiplayer Events Series." Look below to find out how to play and spectate. RDR info here. After a brief intermission (grab some refreshments and head to the loo), we'll begin the second part of the event in Team Deathmatch in The Lost and Damned which needs to be started via Party Mode using the in-game cellphone. Make sure that your team size is at least two people for the first round of play. By starting up Team Deathmatch from Party Mode, you will be automatically placed in special lobbies together with us and other event participants. More info on using Party Mode is listed below. As the event progresses, we'll be playing more multiplayer modes in The Lost and Damned. We'll switch over to The Ballad of Gay Tony at around the halfway point. Keep your eyes on the chat to stay completely up to date on which modes we're playing! Cant jump in and play? Follow all the action at the Social Club Multiplayer Events page. As usual, we'll have a live streaming video broadcast of the in-game action plus a chat box so you can discuss all of the action with other gamers. Hit up the chatbox during the event or just post your PlayStation Network ID in the Comments section below. Save your current game. To get started, fire up the in-game mobile phone by pressing "Up" on the keyboard. Select Multiplayer > Party Mode > Yes. Next, open up your phone again and select the Friends option to invite at least one person into your Party Mode game. Once your team is ready to roll, open up the in-game phone again and select Games > Team Deathmatch. Participating PlayStation Network IDs for the Episodes event include PlayRockstar1, PlayRockstar2, PlayRockstar3 and PlayRockstar4. Only add one PSN ID to your friends list to play.